Respiratory syncytial virus: Are we making any progress? It’s fall in the PICU, and we just saw our first severe case of respiratory syncytial virus (RSV) of the season. RSV is by far the most common cause of bronchiolitis in infants. To scientists, RSV is a fascinating virus with several unique properties. One of these is its behavior in the population. When it’s present, RSV is everywhere. Then it suddenly vanishes. There are exceptions to everything in medicine — I have seen sporadic cases during the off-months– but generally RSV arrives with a bang in mid-winter and then leaves suddenly in the spring. It’s the only virus that consistently and reliably causes an epidemic every year, although it often alternates more severe with milder visitations. RSV epidemics often have some regional variability. For example, often one city will have a much more severe epidemic than do others in other regions of the country. RSV has a high attack rate — the term scientists use for the chances a susceptible person will get the infection if exposed to it. That, plus our generally poor defenses against it, explain the frequent epidemics. Every year a new crop of susceptible infants enters the population. By the age of two, virtually all children have had RSV infection. One aspect of RSV that interests medical scientists is how poor a job our immune systems do in fighting it off. Virtually all children are infected with RSV during the first few years of life. Not only that, all of us are reinfected multiple times during our lives. Attempts at devising a vaccine for RSV have thus far been unsuccessful. In fact, early versions of an experimental vaccine seemed to make the disease worse in some infants, raising the possibility some aspect of our immune response to the virus actually contributes to the symptoms. RSV is generally not a serious illness, causing cough and some wheezing, but for some children, it can be life-threatening. Usually, these children are very small infants, especially those born prematurely, and those with underlying problems with their lungs or hearts. For those infants we have a monthly shot (called Synagis) that helps reduce the severity of RSV when they get it, and may even prevent a few cases, but it is not an ideal treatment. Older and otherwise normal children, such as toddlers, can also get severe cases. We have no idea why that is, although it appears to me children with established asthma often get more severe disease. So what is bronchiolitis? What does it look like? In medical terminology, adding the ending “itis” to a word means whatever comes before is inflamed. Thus tonsillitis is an inflammation of the tonsils and appendicitis means an inflamed appendix. 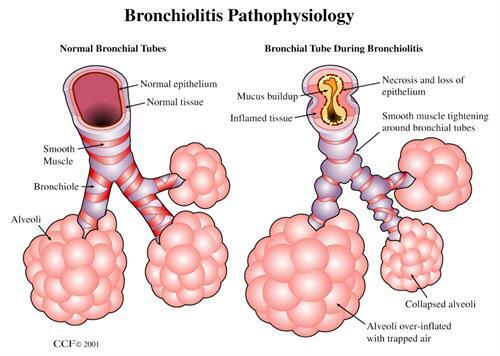 So bronchiolitis is an inflammation of the bronchioles, the final part of the system of air-conducting tubes that connect the lungs with the outside world. Beyond the bronchioles are the alveoli, the grape-like clusters of air sacs where the business of the lungs — getting oxygen into our bodies and carbon dioxide out — takes place. Bronchiolitis is a disorder of blocked small airways. This prevents air from getting in and out normally, primarily out. The bronchiole tubes are blocked from swelling of the walls and from debris caused by the RSV infection — bits of broken airway cells and mucous plugs. This picture shows what it looks like. For my entire 35 year career, we have had no specific treatments for RSV bronchiolitis. Various things have been tried over the years, but nothing seems to help. Care is supportive, meaning we use oxygen, frequent suctioning of mucous, IV fluids or nasogastric tube feedings if the infant cannot drink, and a mechanical ventilator for severe cases. We just have to support the child until the infection passes. But researchers have not given up on an RSV vaccine. There are several candidate vaccines in the research pipeline, and the World Health Organization predicted in 2015 we will have one within a decade. If we don’t have a vaccine to prevent RSV, what about a drug to treat it, to inactivate the virus? Several agents, such as ribavirin, have been tried in the past and rejected. We may be making progress on that front, however. A new drug (GS-5806) has been identified that inactivates RSV in the laboratory. It has also been tested in normal adults. They were given the test drug and then challenged with the RSV virus. The drug did not prevent disease, but it did significantly reduce the symptoms and the total viral burden. There are now several clinical trials underway testing the drug in adults who are at high risk for severe RSV, those with compromised immune system. It seems to help. That’s all fine, but what we really need is information if it works in infants and small children, and as of yet there are no clinical trials to answer that question. One from Australia was apparently started but then withdrawn, reasons not stated. So, to answer my question in the title: Where are we with RSV prevention and treatment? I agree with WHO that we will eventually get a vaccine, a drug, or both. But right now we’re still stuck where we were when I started doing this in 1978 — supportive care. It’s frustrating, but RSV is a wily virus. Right now the best thing parents can do is try to postpone their infant getting it for the first time, especially if your child was born prematurely. < Previous post See what happens when you give a doctor a user-friendly EMR?